I am sure you are trying to shop that last minute Christmas gift online so it reaches someone by Christmas. If you shop at Amazon.com, would you like to find out how to find secret discounts at Amazon? 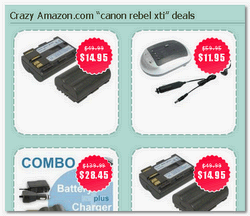 I have found 2 sites that share this money saving discounts and the timing can’t be better. Secret Amazon Discount works by offering you a search interface where you put in your search keyword and choose the discount you are looking for. (10% to 99% off) Amazon keeps track of their price drops and this tool helps you find those items with price drops. It offers you a comprehensive result with discounts. You can also sort the results by relevant results or price like how Amazon lets you do it. The good part is that the results are browseable in your familiar Amazon.com interface rather than some other site. As you can see, it does let you search some international Amazon sites as well. JungleCrazy is another great site to find Amazon.com items with deep discounts. I liked the tag cloud view this site offers as soon as you enter. On mouseover, it shows the product details and the discount % plus the rating a product has received. Clicking on a product takes you directly to Amazon’s product page where you can find out more details about the ne you are interested in. I know I said two services. But, who’s counting right? While you are trying to save money at Amazon.com, how about getting a price comparison from other businesses as you are shopping for an item? 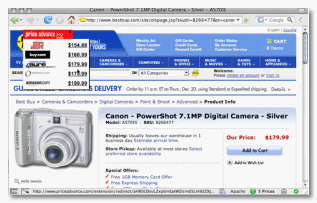 PriceAdvance is a Firefox extension that can be enabled in the status bar when you want to compare prices as you shop. It works by comparing the item you are looking at with other retailers and showing you the prices elsewhere right that instant. This absolutely beats having to go to sites like Pricegrabber to compare prices yourself. PriceAdvance works currently at major sites like Best Buy, Circuit City, Walmart, Amazon, etc. Although, reviews elsewhere have reported that they have some kinks to work out where it sometimes fails to show discounts offered or not show the current price, etc. A very interesting idea though and I am about to give it a try. It is like shopping at Wal-Mart! Thanks for the PriceAdvance plug! We are aware and working hard to iron out the kinks in the application. Before we take PriceAdvance out of beta we plan to add a handful of new features and supported sites. Adam.. thanks for the comment and the update on the extension! I love your other products like Bugmenot as well and you have a great concept with PriceAdvance. I’m looking forward to the new features and would love to feature it in my Extension Picks post. This is a timely post in view of the shopping season.